The exigency was the need to express, connect, and to find a sanctuary, with internet and social networking sites an agency was provided to more than a billion users of the internet to create the biggest social virtual community in the world. As Timeline previously viewed the chronicle of social networking sites, the article we be discussing issues of numbers, age correlation, and the increasing influence of social networks. 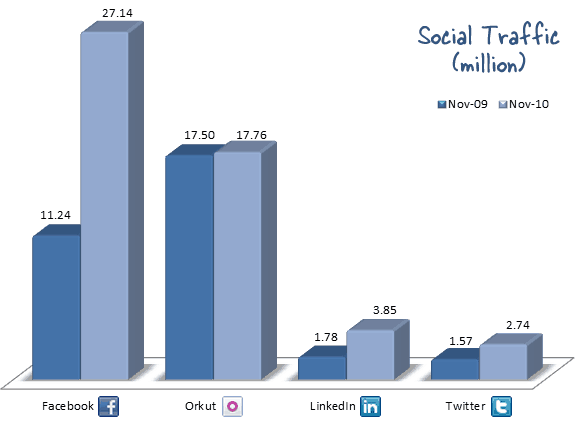 From year 2008 to 2009 Facebook, for instance, has increased double to more than 150 billion users, Twitter in the same year also increased more than 400% to reach 60 million. On the other hand, sites which did not rise to the competition where over taken by other sites, MySpace as an example, lost more than 15% in the same year. This increase was worldwide effect, in Latin America from 2007 to 2008 Facebook users rapidly increased to more than 1055%. India is one of the largest countries using social networking sites and it increase in numbers is represented by this Graph. Yes social networks provided a convent agency to the audience, but other factors helped attracting more audience into these sites. “Spam” (Un wanted mail as ads) was one factor people “left” social sites; HI5 and MySpace both had millions of active users, but as “Spam” increased users became reluctant to use them specially with Sites as Facebook and Twitter provided an “UnSpam” networks. Social Networks had features like “synchronizing” which connects the virtual account as (Facebook or Twitter) to the personal mail (Yahoo or Hotmail), which increases the coverage and reach of these sites giving it more influence on users lives. A Feature which, in my opinion, made social networks outdo all other virtual communities is the applications feature. Tons of applications are available through social networks, from business and political applications to dating and makeup applications, and it simply make these networks more addictive to the mass. This wide range of applications made users reluctant to survey other Apps-sites which previously dominated the web; horoscope for instance, is a highly checked trend, which multiple sites provided, but now Facebook is the most visited website for this specific feature. Facebook also possess a massive range of applications, it also allows users to create and publish their apps through the site. The growth of Social networking sites extended beyond any specific age genre, all ages interact using social networks. “While people in their teens and 20s were the first to adopt social networks for everyday use, they aren't just for the younger crowd anymore.” a new study from Forrester Research claims. According to the same report Companies can begin to target people over the age of 34 with media campaigns that leverage social networks as that age group has become the largest segment using Facebook, Twitter and other social media. What might have caused these specific ages to increase its usage of social networks? A new study from the Pew Internet and American Life Project believes that there are see factors that made social networks “not just for kids anymore” Reconnecting, Chronic Disease, Bridging the Generation Gap, and finally Gaming. While the report may have correctly identified the reasons why older people are the most genres that is using facebook, it’s also true that Reach and Coverage are the main reasons that they have initially used these sites. With the ultimate reach and coverage, hundreds of millions of users, and with no regulations Social networks possess a limitless influence politically and socially. While the intuitive initial fear might come from the creators of these sites and how they would use this power laid upon them, but the more rational fear is how the creators are letting users gain influence on other users. To further prove my argument this is a video posted in 2008 about the “infinite power of social networks” and how their power is increasing daily. While a lot of people doubt the exaggeration bluntly made in this video, there is no empirical proof that this ultimate reach and coverage could be used in harmful and maybe fatal ways. A simple word as "good morning" is transferred worldwide millions of times and in seconds using a social network as Twitter. Finally, the Growth of Social Network is rapid and predictably unstoppable, it attracts more and more daily from all ages, and it has an ultimate influence over a billion people. A simple poll on facebook is taken by millions in a matter of seconds simply because of its reach and coverage. News, Horoscope, Games, and Social services all are now available online through Social Networks. Its influence become fatal when peoples’ lives become dependent on it, and by the look of it, we are approaching it rapidly. Cheuk, Bonnie. "Social Networking Analysis." Business Information Review 24.3 (2007): 170. Web. 24 May 2011. Montalbano, Elizabeth. "Forrester: Social Networking Grows up." PC World 26 Aug. 2009. Web. 22 May 2011. <http://www.pcworld.com/article/170866/forrester_social_networking_grows_up.html>. Pradeep, Kumar S. "The Growth Of Social Networking Sites In India." Chart. Digital Inspiration. 9 Feb. 2011. Web. 30 May 2011. <http://hellboundbloggers.com/2011/02/09/growth-of-social-sites-india/>. RESTON, VA. Social Networking Explodes Worldwide as Sites Increase Their Focus on Cultural Relevance. ComScore. 12 Aug. 2008. Web. 23 May 2011.